Continuing our series of predictions for each division, this time I'll keep the comments short as the season is already under way and these need to get finished. The Astros are no longer around to serve as a punching bag for the rest of the division, but the story here remains the same: a battle for first between the two teams who wear red. 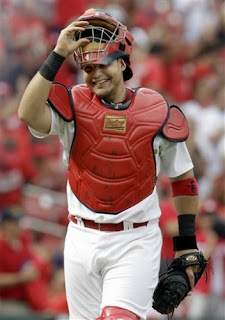 Yadi shall lead the way for the Cards. A very strong offensive team with one of the top hitting prospects in baseball (Oscar Taveras) still stuck in the minors waiting for a spot to open up. They'll score plenty, it's just a question of whether the rotation holds up without stalwart Chris Carpenter around. They've got a few young pitchers who'll end up either in key relief roles or starting, I think it'll all work out fine as one of the game's best catchers Yadier Molina will be behind the plate to guide the new blood. New outfielder Shin-Soo Choo is a perfect fit for this team offensively but their plan to let him play centerfield is odd. Choo has barely played there in his career so expect some misadventures in the Cincinnati pastures. While they don't have any major weakspots, I see this team as clearly inferior to the Cardinals offensively. Pitching-wise, they're probably superior to the Cards with two excellent starters leading the rotation in Mat Latos and Johnny Cueto. The bullpen also looks pretty mean. I think it'll be a close race between the Reds and Cards for the top spot, with the loser right in the mix for the Wild Card. As I've always liked this team and am currently dating a nice girl from Milwaukee, I'm a bit partial to them. Some people expect them to be terrible, possibly destined for a last place finish. I can't see it happening. The offense should be among the NL's best (they actually scored 55 more runs last year after losing Prince Fielder) and the rotation looks shockingly adequate. They missed out on a playoff spot last year almost entirely because of a league-worst bullpen. Any improvement there and they should be a factor in the Wild Card race. Aside from the Reds, who I actively dislike, I have a soft spot for the rest of the teams in the NL Central. The Brewers, Cubs, and Pirates all seem humbly likeable, while the Cardinals are so consistently good (and have such great fans) I can't help but be impressed by them. The Pirates have been so consistently bad that I can't help but feel bad for them. On paper, this is the best team they've put together in a while, though, and for once Pirates fans enter into a season with legitimate aspirations for contending. In reality, they'll probably end up struggling to get past .500 for the first time in over 20 years while competing with the Cubs and Brewers for third place in the division. Fear not, Cubs fans: your team is in good hands. Continuing their thorough rebuilding of the organization, former Red Sox execs Theo Epstein and Jed Hoyer have put together a serviceable starting rotation that could be good enough to get the team around the .500 mark. The offense has two young phenoms in first baseman Anthony Rizzo and shortstop Starlin Castro so this team will most certainly not be boring. They might even leapfrog the Brewers and Bucs. My guess is a respectable 74-win season (which would be a 13-win improvement on last year).